Since 1951 Archer Engineering has provided conventional machining services for both small and large parts. Turning is a process where a piece of metal is held in a clamping device and rotates while under power. A cutting tool is brought to the rotating piece of metal and under power travels the desired distance on the piece of metal removing material to make a smaller diameter. 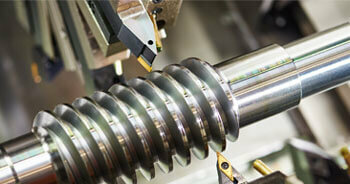 Speeds, feeds, tools and cutting lubricants are determined by the material being turned. The term conventional was added to turning when computer processes were developed. The term conventional now distinguishes manual vs computer controlled. Our work has included parts for the military, robotics, aerospace, medical, and food processing industries. Choosing between conventional and computer is usually determined by shop machines, tools and employees. Call today or send us an email using our secure online form to see how we can help you.